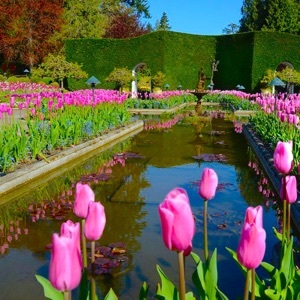 As part of this tour, we will take you to the splendid Butchart Gardens - one of Victoria's most famous and popular attractions! Begun in 1904 as an effort to restore a worked-out quarry site, The Butchart Gardens has since been delighting visitors from all around the world. As you make your way around the gardens, you'll walk through intimate stone paths and streams lined with colorful arrays of flowers and trees. The gardens adjusts their floral displays to suit the season so it is just as spectacular in Spring and Fall as it is in Summer.